So how do you follow that game? Brazil v Chile was nearly three hours of pure football gold, as Partridge would have said. Penalties are the cruelest way to settle such an enthralling tie but you had the feeling that neither side would have scored again if they had played for another hour, such was the tiredness of all the players. But football is about winners and losers so whilst Chile would be heading back home across the Andes, Brazil would be able to go out on the piss until Friday night. But who will they play? 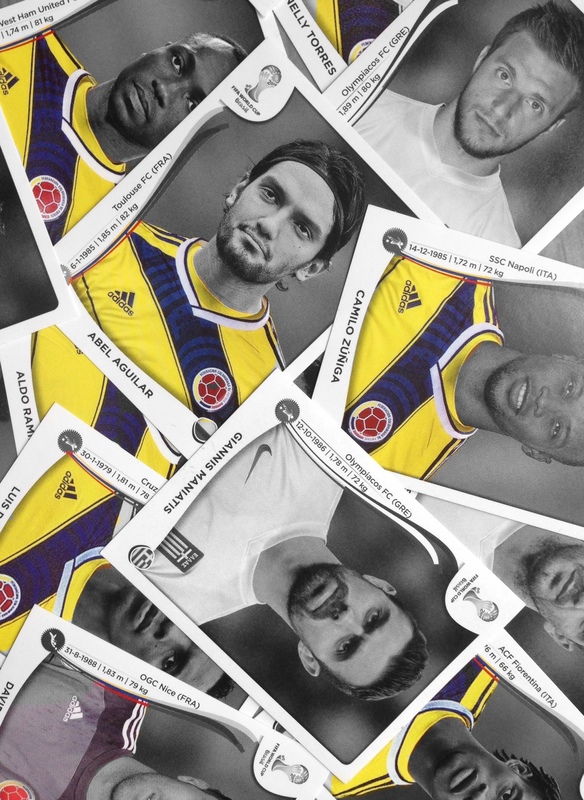 It’s fair to say that most football fans across the world would be shouting for Colombia in this game. Not just for the ridiculous stance taken by Uruguay over Suarez – and let’s not forget that if the average man in the street had done what he did, he could be charged with assault but because the Colombians style of play is nice on the eye, not to mention the frequent close ups of some of their more photogenic fans in the crowd. 1. Clever corner-kicks – So what was wrong with that Colombian corner-kick where he tapped it and then left it to his mate? Not enough of this type of sneaky innovation in the game today so it should be applauded rather penalised. There is always the danger that they will go wrong, as Thierry Henry and Robert Pires will testify. 2. Proper goal – Rodriquez’s opening goal – wow. Wow. WOW. Perfect control, outstanding shot and to make it even better it hit the underside of the bar. Goals are always so much better when they hit the underside of the bar and bounce down. Not quite in the Johnny Metgod class but close…Uurguay’s response? Keep their 5-4-1 shape…of course. 3. Empty seats – Where did everyone who was sitting on the halfway line go? Ten minutes after half time and it was still a mass of empty yellow seats? The Brazilian authorities must have been taking lessons from Club Wembley. 4. The flappy man – Remember the bird man of Colombia from Italia 1990 and France 1998? Well Gustav Llanos is back here in Rio, although he has been stuck in the corner behind the goal. But when his moment came, with a corner to Colombia, he sprung to life and flapped his big wings. The TV cameras seem to have been told to just focus on the pretty females in the crowd in this tournament. 5. Bogie team – The last four games between Brazil and Colombia, outside of the Copa America, have all been drawn – with three goal less games. Expect next Friday’s game to be a corker now. Football, Futbol , Futebol: Travels Around a few Football stadia in Buenos Aires , Montevideo and Rio de Janeiro. February 2009. By Paul Whitaker. “Two English football supporters, twelve days, three South American countries, seven football matches, eleven stadiums and one Diego Maradona tour”. Walking up Wembley Way with my mate and fellow England supporter Glenn Hinch, prior to the 2007 European championship qualifier match between England and Estonia, I did not know this would be my last England match attended as a supporter. After 15 years following ‘Ingerland’ to two World Cups, two European championships, Athens, Baku, Glasgow, Warsaw and many more European cities between, I was to sit through just another 60 minutes before coming to the conclusion that my match day experience on and off the pitch with England, was no longer an enjoyable one. At first I thought I was just going through a sort of football-supporting mid-life crisis that seemed to afflict each generation of my family. My grandfather had apparently bemoaned England getting a footballing lesson from Puskas’ Hungary in 1953 and my father still gets misty eyed over Gunter Netzer’s Germany or Johan Cruyff’s Holland, rather than Kevin Keegan’s England in the 1970s. I thought the late, great Bobby Robson had the best teams and chances to reach a World Cup final, but was thwarted by the Argentinians and Germans in 1986 and 1990 respectively. OK, perhaps that was just misplaced nostalgia, but I was struggling to understand why English football had not moved on since Italia’90. Whilst German, French and Italian supporters had all watched their national teams lift the World Cup in recent years, I was watching the England team of 2007 put in yet another ‘laboured’ performance, this time against a poor Estonia team. We had the full repertoire of English fallibility on display, including poor movement off the ball, losing concentration in defence and my particular favourite, an inability to retain possession of the ball. The win against Brazil on Wednesday night had the country falling back into the Olympic spirit but was everyone happy? Our resident Daggers Diary team headed up to Wembley to test the mood of the nation. Last July, I gave up my membership of England fans. After six years, and having attended a decent number of games in that time, I figured that I wouldn’t be able to afford to go to Brazil for the world cup, and so I gave it all up. So of course my exile lasted all of one game, before I gave in and attended the qualifying game against San Marino last October. While it was great going again, the one thing I didn’t relish was the queue to get back to wembley park station after the game. That has always been the one part of the experience that I wish could be changed. Sadly, it still seems to be the same even though the stadium is so much better than its historic predecessor. I suppose the one thing I miss is the opportunity to go to away games, which were always good fun. But in the end, finances won, and I am a home England fan only. So obviously, I am back tonight, in the cold for the start of the 150th anniversary celebrations for the oldest football association in the world. The visit of Brazil always brings memories of the great teams of the past, notably the 1958 world champions and the 1970 side which is still regarded by many as the finest national team ever. It also brings the obligatory shots of the Copacabana beach, as well as various carnival images and the cameraman trying to find the most attractive female Brazil fans in the crowd. The worst penalty of all time? America 1994 was a turning point in world football. By awarding tournament, the stakes were raised and it became all about the money rather than the game itself. You only have to see the logic of scheduling games at lunchtime in the middle of the American summer to realise that it was the TV companies and the major sponsors that dictated the play and not the sensibility. To be sixteen again – who wouldn’t want to go back to such innocent days when compared with the stress and strains of modern life. Sixteen when some of the good things in life were now legal, although growing up with a slightly wayward elder brother meant that I had tried them all long before the 13th FIFA World Cup kicked off in Mexico on the 31st May 1986. Our latest football traveler is Lee Barnett who has literally just stepped off a plane from South America where he had by the sounds of it a fantastic three week adventure in Brazil and Argentina. Below is his travel diary. Taxi to hotel in Santa Teresa area of Rio. Santa Teresa is fairly central and makes most things in the huge city accessible. We were staying at a British owned small hotel called Um Meira Tres. The nearest metro station to the hotel was called Gloria – nice and easy to remember! We were disappointed to find out that the Vasco da Gama match we had planned to take in later that night had been put back to Saturday and changed from the San Januario to the Maracana stadium. We also decided to secure our tickets early for Sunday’s game at Botafogo and so we had to go to their stadium to buy them. Afterwards we headed off to one of the hundreds of Favelas that have sprung up around the city with an English Ex-pat who was our guide. It was a fantastic if humbling experience as to how life can continue in such conditions. Amazingly, after so many years at the top table in Brazil (and only a decade after playing in the World Club Championship), Vasco de Gama were in the 2nd tier of Brazilian football, the Serie B. We took the metro to the Maracana stop, which is conveniently next to the stadium. Over 52,000 fans saw Vasco da Gama beat Bahia 2-1. After the match there were plenty of taxi’s available to take us back into town as most fans used the metro which was heaving to say the least. Serie A was the highlight of the day as Botafogo lost 1-0 at home to Flamengo with Adriano scoring the only goal. The attendance was a decent 25,192 at the Engenhao stadium which is reached via metro to the stop named ‘Del Castilho’ then a short taxi ride. Around the stadium the local residents utilise their gardens as makeshift bars and barbeques giving the whole area a real character and some wonderful smells! There are a couple of more traditional bars close to the ground which are perfectly safe for us foreigners to use! The stadium is new and modern and had some of the comforts from home. After the game it was dark and the area is not the best or the safest looking and it took us a while to find a taxi. Land in this area is cheap and this was the reason why Botafogo relocated here. Our visit to Rio was at an end for a week or so as we boarded our flight to Buenos Aires. We armed ourselves a ‘monedero’, which is the Argentinean version of the Oyster card. The difference is it will only charge a flat rate fare each time you use as opposed to an oyster card where you have to swipe in and out. Each metro journey is ridiculously cheap and this card makes excellent sense and won our “travel tip of the day”. We checked into a fantastic hostel paying just £27 per night. It ticked all the right boxes – Staff very friendly, beer, soft drinks and snacks available and free computer use. Our game of the day was at the brilliantly named Deportivo Moron, which must be up there with Deportivo Wanka. To reach the home of the Morons, take metro line B as far as it goes then get a taxi ride to the stadium. It’s just outside the city limits and is in an ok area with a conference style ground. Open terracing at both ends and a very old main stand. The opposite side consisted of huge advertising hoardings only. The game ended Deportivo Moron 3-1Deportivo Espanol with an attendance of just under 2,500. Within five minutes of the final whistle we were at the railway station close to the stadium and on our way to “Once” main terminus. Despite such a small crowd for this third tier game the police presence was quite high. A trip overseas today as we were off across the River Plate to Uruguay. A metro journey to the port of Buenos Aires where we boarded the ferry. On the other side of the river a coach then takes you from the ferry port to the centre of Montevideo. Travel Tip of the day – when the coach drops you at the bus station/shopping mall buy your return ticket from the office situated here. You have a choice of taking the coach journey back to Colonia for the ferry or taking the direct speedy crossing direct from Montevideo to Buenos Aries. This speedy crossing is the better choice in my opinion. All bookable with a company called Buquebus. We were in Uruguay for the game between Penarol Rampla Juniors which ended in an easy 3-0 win for the home team. The attendance was around the 10,000 mark but as the Estadio Centanario, venue for the first ever World Cup Final in 1930 holds over 70,000 they did look a little lost. But they made up for their small numbers with lots of noise. The stadium was where Argentina had just qualified for South Africa a week or so earlier by beating Urugauy with a late Martin Palermo goal. The stadium is close enough to the city centre to be walkable, and is in a safe region of the attractive city. After the match there were plenty of taxi’s to take us back to the port. Immediately after the game finished I took a cab to Huracan for their game against Rosario Central. The journey was short and the fare very cheap. The cancha (ground)at Huracan is close to the pitch but open all round. Again as with most grounds in Argentina it is in need of updating and restoration. The game finished Huracan 1Rosario Central 0 in front of around 18,000 supporters. Huracan cancha is in an OK area and there are plenty of taxi’s available within a short five minute walk from the main road. Alternatively if the game is an afternoon kick off you can get the metro to ‘Caseros’, although the Metro stations close at about ten o’clock. The highlight of the day was our trip to Boca Juniors. A metro trip to ‘Constitution’ station and then a cab to Boca is the simplest way to reach the stadium. Boca is a bit dodgy in terms of the surrounding areas and the cab driver advised on not wearing my watch! The stadium sits in a complex of other sports venues as do most of Argentina’s football stadiums. 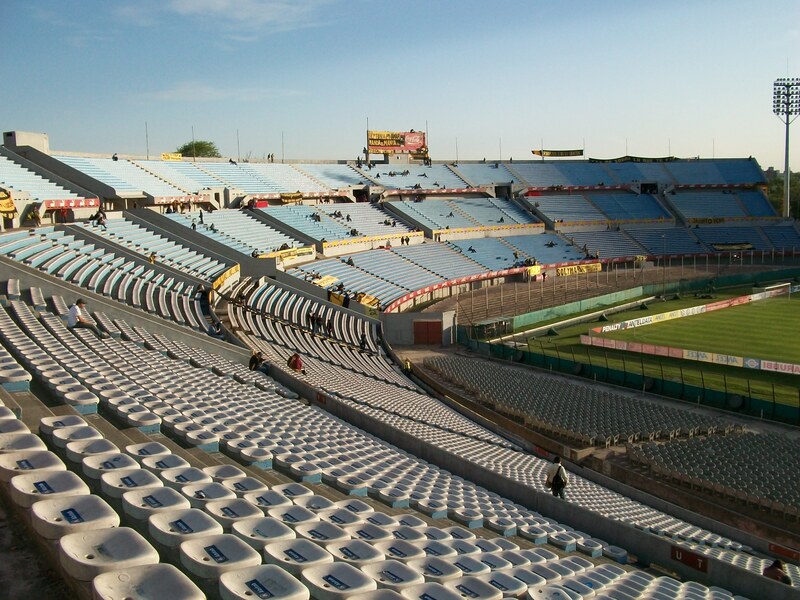 The Boca stadium looked from the outside in a good state of repair unlike most in Buenos Aires. When we reached the ground we found out that because the game later in the day against Chacarita Juniors was high risk there would be no tickets on sale today! I Couldn’t believe it – to have come so far and be so close to the highlight of the trip. My story quickly passed around the ground and we did manage to buy tickets from a steward after he made a few phone calls. The ticket were delivered to me by a policeman! Only in Buenos Aires! Inside the ground there was a fantastic atmosphere. This was only going to be a small game in terms of attendances but you got the urge to come back for a bigger game. The views from the the third tier where our seats were were fantactis. When it gets really going the whole stadium literally shakes with the noise and energy from the supporters. The final score was Boca Juniors 3 Chacarita Juniors 0 and the official attendance was close to 30,000. After the excitement of seeing a game at the great Boca stadium it was off to a lower key game. Game number two of the day was All Boys versus Gimnasia Jujuy. All Boys stadium is named the ‘Estadio Los Islas Malvinas’ – The Falklands Island Stadium. I took a taxi from San Telmo to the ground but there I was unable to get a ticket for the mainstand (platea) so instead took my chances with a place in the popular side. The ground had three sides of terracing and a platea of two tier seating. The ground is well kept though the crowd was only 2,000 to watch a 0-0 draw. Just round the corner from the ground I caught a bus that ran back to the city centre although cabs are also available from the main road. Travel tip of the day – “Always buy the ‘Ole’ newspaper to confirm venues and kick off times as they can change at quite short notice”. If you can read Spanish then the paper is a great read. 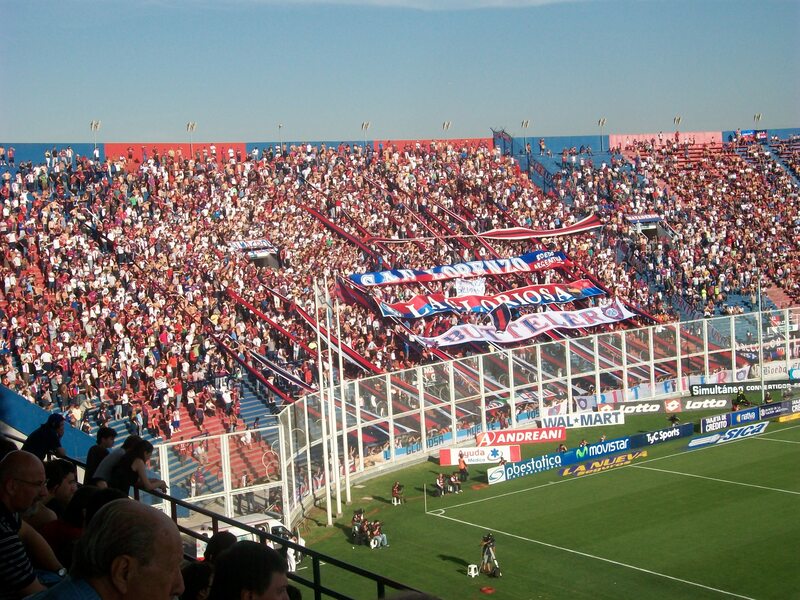 Today I was off to the River Plate stadium to get a ticket for the game on Sunday versus Lanus. I wanted to make sure I got a ticket in the shade as Argentina can get very hot at this time of the year. To get to River Plate you need to take the metro to ‘Conresso de Tucuman’ station. Then it’s about a twenty minutes walk in a straight line down Avenida Calbido. The stadium is in the upmarket Nunez area of the city amongst shops including the ‘Rivermania’ store. Not that big a store by UK football grounds standards, but it stocked some good football gear. I picked up my ticket for the River game on Sunday and then headed off to Platense a five minute cab ride away. Platense is like an old fourth division ground going back to the early eighties. Three sides are terraced and the fourth, the platea had almost antique seating. All areas are open to the elements with no cover at all. I managed to blag a free press pass here to gain entry to the press box from which I had a great view of the game while being fed sandwiches and cakes. Marvellous I thought until I realised that the policeman that searched me on the way in had stolen my credit card! What comes around goes around in these parts! It was a poor game for a second division match and the final score was Platense 0 Ferro Carril Oeste 2 in front of an attendance of 3,000. Immediately after the game a bizarre series of events unfolded. Initially I saw a supporter run across the pitch towards the players tunnel, with in hot persuit three policeman, batons waving, trying desperatly to keep up with the invader. Then to everyones astonishment the players prevented the supporter from taking a beating from the police by ushering him up and over a very high fence that surrounded the pitch. Then there was a commotion in the tunnel. I decided to walk down the internal staircase of the platea only to be confronted with press guys frantically coming back back up towards me holding their noses and covering their mouths from tear gas let off by the police in the tunnel area! Never a dull moment in Buenos Aires I can tell you! After the match a cab to ‘Congresso de Tucuman’ metro station was my reward for an interesting afternoon of football. Another two match day. First up was a game at Atlanta. The ground is situated very centrally in the city. It was a third division match. so I did not expect a big crowd. A metro ride to ‘Dorrego’ then a walk down to the level crossing, turning right into Humbolt. The ground is on the right. All together it is about six or seven minutes from the metro station. Again the ground is fully open to the elements. It had recently been revamped with new large terracing at each end. The main stand is large and crumbling but has the old seating from Boca Juniors repainted. The opposite side has no stand, only advertising hoardings and fences. From the club shop an old piece of bleacher mounted on a plinth can be purchased for thirty peso’s (about five pounds sterling I calculated). I thought about buying one for Simon Inglis who seemed to have a fascination for bleachers having read his book about Argentinian football. The final score was Atlanta 1 Los Andes 3 in front of no more than 400 people. A poor crowd may have been a result of the torrential rain that fell all day. Porteno’s fans do not like getting wet especially in an open ground in the third division. After the game a short walk back to the main road was all it took to get a cab to Velez Sarsfield. At Velez Sarsfield ticket office I had a bit of trouble with the language. My Spanish is not what it used to be and so I ended up with a ticket in a standing area behind the goal. That was fine except the rain by now was incessant. I took the metro to ‘Carabobo’ on the A line then hailed a cab. Its not far from the metro but the rain was still falling and the cabs were dirt cheap. The final score was Velez Sarsfield 2 Gogoy Cruz 0 and they should be fortunate that as many as 13,000 turned up on such a poor night. Another couple of games on the agenda for sunday. First up was Chacarita Juniors versus Argentinos Juniors, being played at the latters stadium, although I still had no idea why. I took the metro to ‘Carabobo’ on line A, then a short cab ride. The ground is small for the first division. It has a two tier seated main stand where tourists like me could gain entry. In front of the stand is a small paddock of standing. The opposite side is a large stand, two thirds of which is terracing with the remainding third open seating. The home end is a small open terracing. There is no stand at the other end, just advertising hoardings and green tarpaulins to stop outsiders peering in. Despite it being a bit rudimentary a good atmosphere was generated in the ground by the supporters – Everyone sang here. I left the ground early to get a cab to River Plate for the big game with the score nicely poised at 2-2 (which eventually was the final score). The cab from Argentinos Juniors to River Plate was fifty peso’s – a bargain for the trip through the traffic. 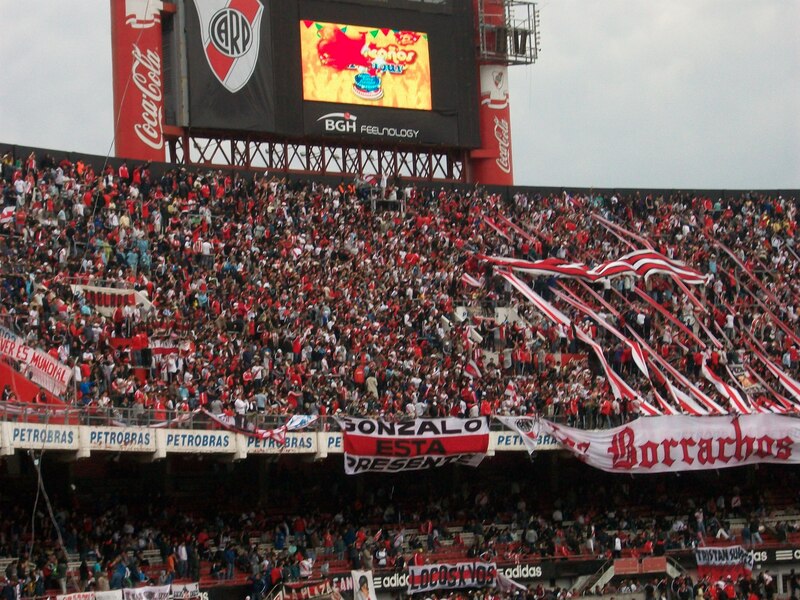 After arriving at River Plate I got into the ground, and found my seat with ten minutes to spare before kick off. The River Plate stadium is a big open mostly seated two tier stadium with an athletics track and a moat. The result River Plate 0 Lanus 1 which was a surprise and most of the 18,000 in attendance ended a miserable afternoon soaking wet as the rain continued to fall. In Argentina after the match is finished the home supporters are kept in the stadium for fifteen minutes to allow the away supporters to get away – the complete opposite to what we see in Europe. During this period no home supporters are allowed to leave the ground. This is stringently enforced by the police. If you need to leave early to ensure you get a cab this could potentially be a problem. If you do need to leave early to go to another game or get a cab ensure you get a ticket for the main stand. This will give you a better chance of getting away ealier if you need to. Behind the goals forget it. Back to the airport for the flight to Sao Paolo. Apart from a trip up to Portuguesa’s stadium to buy a ticket for the Tuesday night it was a day of relaxing. The game of the day today was at Portuguesa. A metro ride to Tiete/Portuguesa then five minutes in a cab or fifteen minutes walk gets you to the ground. The stadium is a crumbling mess. It is in desperate need of being pulled down and a replacement built. I hate to say that about any ground but its in a terrible state. The floodlights are on massive concrete stanchions set back behind the stadium. There is a seated area of about four thousand seats. The remainder of the ground is terracing with seated markings on them in a shallow open bowl. Only two floddlights are lit until two minutes before kick off to save money. The home supporters (around 6,000) were clearly not happy with the club and displayed their banners upside down for the duration of the match although they did go home happy as Portuguesa won 2-1. A coach trip from Sao Paulo to Paraty today. I had originally planned to stay in the city for Corinthians match but it had been put back to the weekend so headed to Paraty instead and spent a couple of days here. A coach trip early in the morning from Paraty to Rio de Janeiro and straight away a metro to ‘maracana’ station for Vasco da Gama versus Juventude. If Vasco won they would be guaranteed promotion back to Serie A. The ticket office stopped selling tickets while I was queuing (and had been for an hour and a half). I went back to the ‘Maracana’ metro station where the touts were. They only had tickets in the cheap Geral but I figured that any ticket is better than no ticket. They charged triple the price but that still doesn’t amount to much as the ticket was only seven reals to start with. The match atmosphere was fantastic with Vasco da Gama’s 2-1 in front of 81,906 enough to see them promoted. So for the final game of the trip – Fluminense. Another metro trip to the ‘maracana’ station, a walk across the walkway and hey presto – one of the world’s biggest stadiums is right there. I Decided to posh it up for this game and bought a ticket next to the dirtectors box. The Cost of ticket was 120 reals , about £45. There was a great atmosphere as relegation threatened Fluminense were playing top of the table Palmeiras/ Fred scored the only goal of the game for the home side in front of 66,884. So that was the end of an amazing trip. Games in three countries and countless memories. I had a couple of days of sightseeing to do the more cultural stuff before I headed back to London overnight on Tuesday. Many thanks to Paul Whitaker for providing the following article. It can be read in detail at our sister site Budget Airline Football here. ………… where television’s influence on football there is a force for good for the visiting football traveller. With the league fixture spread out over the Friday , Saturday and Sunday, you had the opportunity of not only attending 2 to 3 football matches over the weekend, but with staggered kick -off times varying from 5pm to 9pm, it was possible to attend two football matches in one day!. If live football three nights a week is not enough for you, why not check to see if any of these twelve clubs here are playing any Copa Libertadores or Copa Sudamericana fixtures between Tuesday to Thursday? ………..where you can stand in a packed football terrace participating in some of the world’s most passionate match atmosphere and all for the distinctly un-english premiership price starting from £6-10. The cheap prices continue outside the stadium, where a post-match steak dinner, away from tourist areas will set you back about £6. …………where even if you arrive to find its football league fixtures have been suspended due to hooliganism (well I told you they were a lively lot over there! ), you have choice of at least two other countries in this part of the world who can boast as many exciting football fixtures and an equally rich football history, great players, famous clubs, iconic stadiums and charmingly lunatic supporters.